In October 1944 the Canadian forces in North Belgium crossed the Dutch border during Operation Switchback and landed on the Dutch coast. 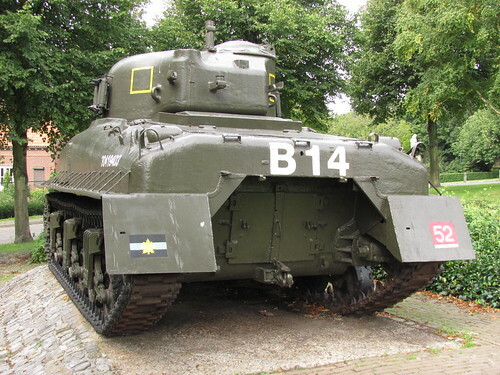 The objective was Antwerp and in an effort to secure the approaches the village of Woensdrecht was attacked by infantry from the 2nd Canadian Division, supported by tanks from the Fort Garry Horse. The village was first assaulted by the Black Watch of Canada on 13th October – which became known as ‘Black Friday’ as they sustained 183 casualties in that action. Woesndrecht was finally taken on 16th October by the Royal Hamilton Light Infantry and held for five days against repeated attacks from German Fallschirmjager, Paratroop, forces. The Royal Hamiltons suffered 167 casualties in the battle, 21 of them fatal. 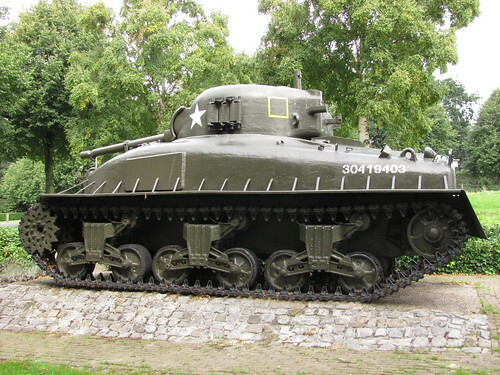 The Fort Garry Horse had landed in Normandy and fought through the campaign. 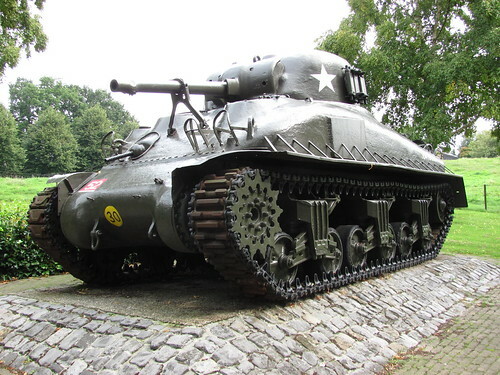 The memorial here to them takes the form of a M4A4 Sherman with a cast hull. It appears to have been a former range target given some of the damage, although this could be battlefield damage from a wartime wreck. The tank is painted in Fort Garry Horse colours as used in the battle.